This study presents information about the benefits of early mobilization in humans and implicates that this may be generalized to equine rehabilitation. However, in some cases immobilization is necessary, for example with wounds, fractures, and severe ruptures. During nerve regeneration, early mobilization may slow down revascularization and creates scar formation. However, muscle, tendon, and ligament tissues require appropriate loading during healing to maintain their strength and function. 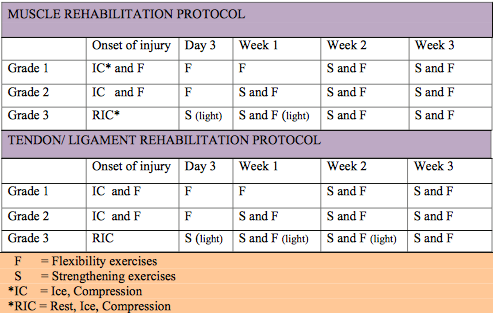 With grade 1 and 2 injuries mobilization exercises can begin between 1 and 3 days after the initial inflammation period is over. In grade 3 injuries, active mobilization should start after 3 weeks, however passive mobilization can begin within 3 days after injury. Generally, with severe injuries, stabilization is the first priority, obtained through muscle strengthening. However, if the strengthening phase lasts too long, flexibility can be hindered. Flexibility exercises are the most commonly overlooked in rehabilitation. Controlled stretching can increase collagen synthesis and improve fibre alignment, leading to improved strength. > From: Schils et al., AAEP PROCEEDINGS 56 (2017) 374 - 380. All rights reserved to 2010 AAEP. Click here for the online summary.